OTHER WORLDS page 7 STUFF, STUFF, STUFF, AND ETC. I received a copy of Wild Hair, the Hirsute Fanzine, a few days ago and all I gotta say is ""WOW."" It's the hottest thing since the Chicago fire. Ashley, Burbee, Condra, Laney, and Rotsler express their opinions on various things. I dont know. More Flying Saucers??? This time in Kentucky and Tennessee. Various citizens in those states say they saw it right above the sun. It was described as a bright bulb shaped object. It was seen at Clarksville, Nashville, Columbia in Tennessee and at several points in southern Kentucky. Astronomers say they believe it was a weather balloon. The flying saucer story was sent me by Eugene Randall, and announcer for a radio station in a near by town. He tore it from the news printer at the station. When are those supposed scientist going to quite their bull shooting and admit they don't know what in the hell it is. I, for one, am sick and tired of having hundreds of people called liars by a few men who think they are so damned superior to all the rest of us because they are "scientist." I don't meanthat I falll for every Fortean story that comes to light but, at least let's give those observers credit for having reasonable itelligence. What ever happened to the donation NFFF was supposed to get from the Pacificon. I'd be glad to publish an article by someone who knows just what is the score about that. Are they obliged to contribute the money or was it just arbitrary? Who is to blame? etc. W. C. Butts of 2058 E. Atlantic Street, Phila., Pa. has books for sale or trade. Write him for a list. Don Hutchinson of Toronto, Ont. Canada announces his fourthcoming fanzine, Macabre. It will contain stuff by Les Croutch, Ackerman, Kennedy, Rotsler, and other notables. Almost forgot to give Don's adress :: 7 Tacoma Avenue, Toronto 5. Millard Grimes, local fan and letter hack, sold a story to True Comics. This happened sometime back but I don't think the news has been spread. His story, about some ancient Greek orator, hasn't been published yet to my knowledge. It has been reported that one dealer in Maine is asking one dollar each for 1948 Amazings. There must be a scarcity. 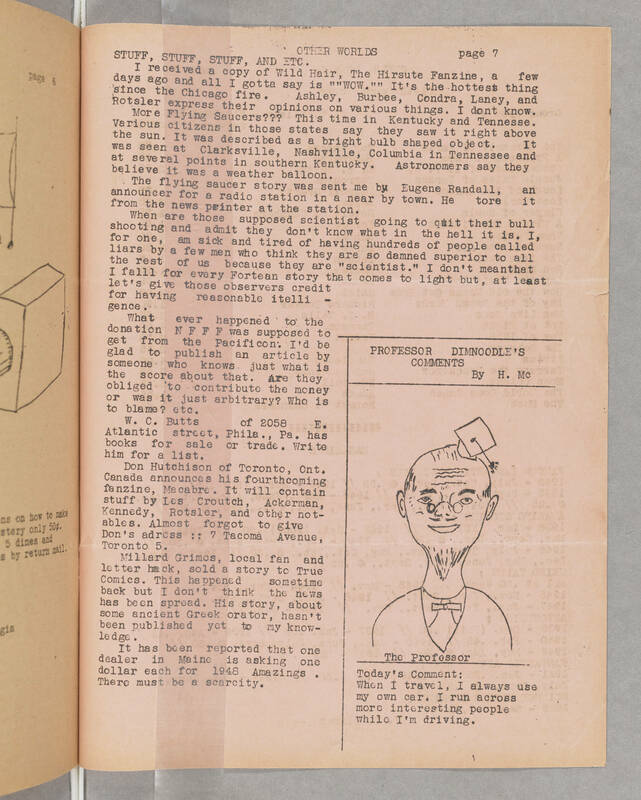 [On right hand side of page is box with text and illustration of balding man, wearing a university cap, with a goatee and classes, entitled "The Professor."] PROFESSOR DIMNOODLE'S COMMENTS by H. Mo [illustration] The Professor Today's Comment: When I travel, I always use my own car. I run across more interesting people while I'm driving.